After a long day at work, I got home at 1am on the morning before the meet. This was… not ideal… I'm fortunate to have shot a number of multi-day competitions in the past, and that experience guided my first actions once I got home. Step one was to make a checklist. When you are or will be dealing with fatigue and stress. When your survival depends on having the right tools for the situation. When wasted time will directly impact how well you'll be able to do your job. A checklist is the best tool to mitigate all of those risks. Almost everything in this picture was on the checklist, and having this stuff ready to go was my foundation for the weekend. I've run out of water before and I've run out of food before, and there's nothing worse than to be in a position to do great work and then to miss those moments because you're trying to find a water fountain, or you're starting to feel light-headed because of dehydration or low blood-sugar. The checklist also included a bunch of items related to physical comfort. Extra socks. Extra shirt. Both pairs of sunglasses. Extra hat. Waterproof jacket… Just like in an endurance race, the better you take care of yourself at the start, the better chance you'll have towards the finish. 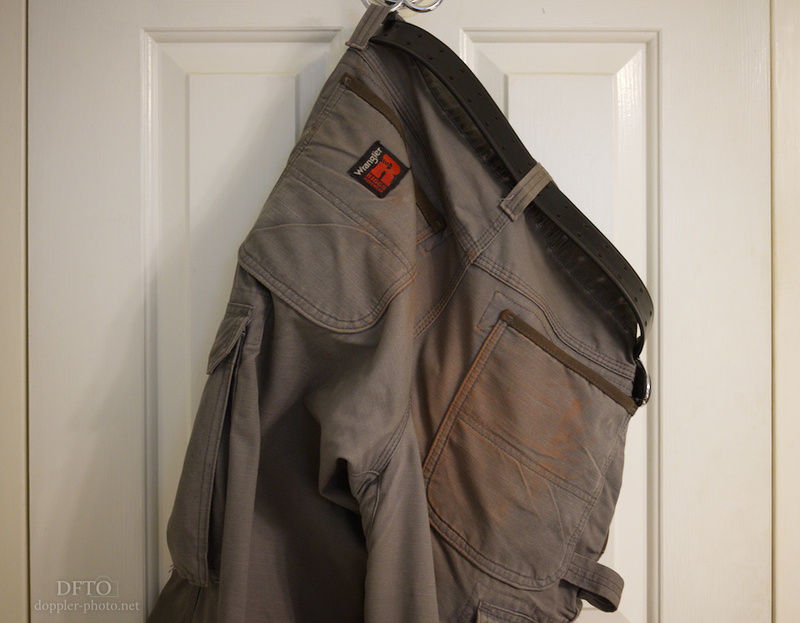 These pants are also an important aspect of my shooting infrastructure. 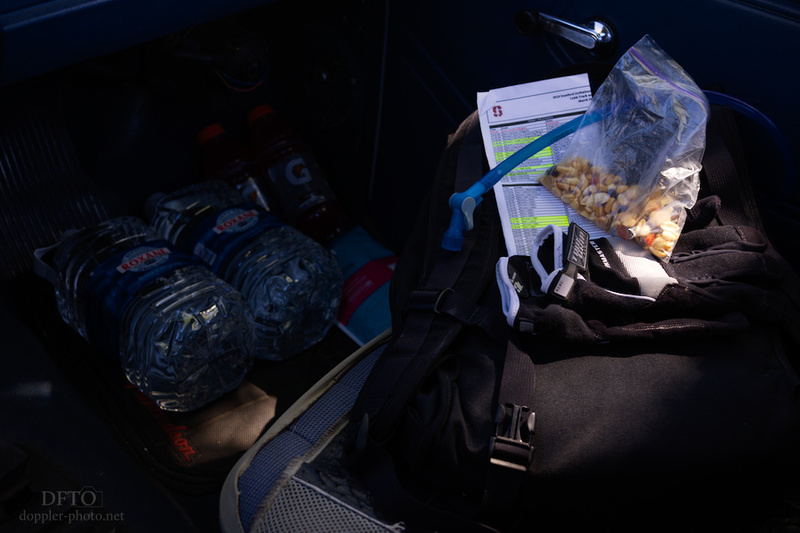 They have enough pockets for the things I need to have at hand (such as trail mix, so I can feed myself during the 30 seconds between two heats of a race). And I keep some shooting equipment (memory cards, ND filters) on my belt loop all day long, so it's super useful for comfort and for peace of mind to have a belt that I can depend on. Having lost a filled memory card before, let me tell you: the worst feeling is when you know where it's supposed to be, and now there's nothing there. Having equipment you can trust, and a setup that has secure places for everything you'll need, means that you can spend less of your time worrying about that stuff and more of your time worrying about what you're shooting. One of the items on the checklist is "Print schedule." For me, that's a reminder to not just print the schedule, but to also do the planning it'll take for the day to go well. 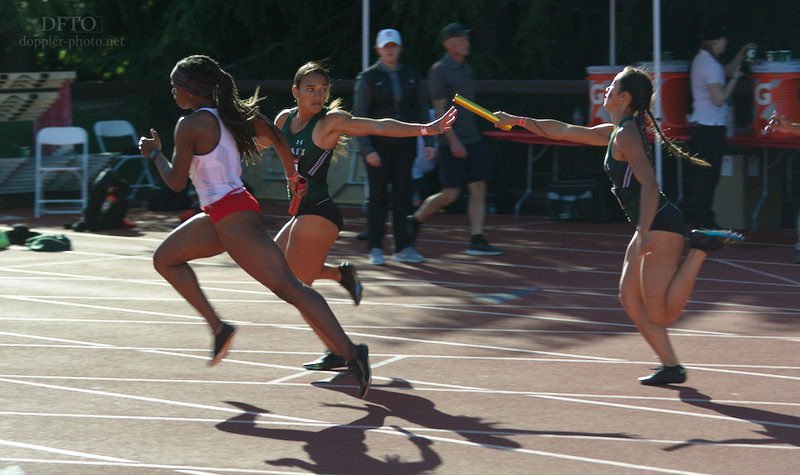 The most fundamental challenge in shooting a large meet is that there's so much happening all the time. It takes a lot of energy to try to be everywhere at once, and it also takes energy to decide which places to stay and which places to leave. If you have the anxiety of worrying about places that you aren't covering, that just pulls even more energy away from making the shot that's actually in front of you. So when I make the day's plan, I try to make the hard decisions before I get to the meet. I will prioritize certain sections or events and compromise others. For instance, I generally prioritized invitational events over collegiate events, and collegiate events over high-school events, and I set my schedule accordingly. 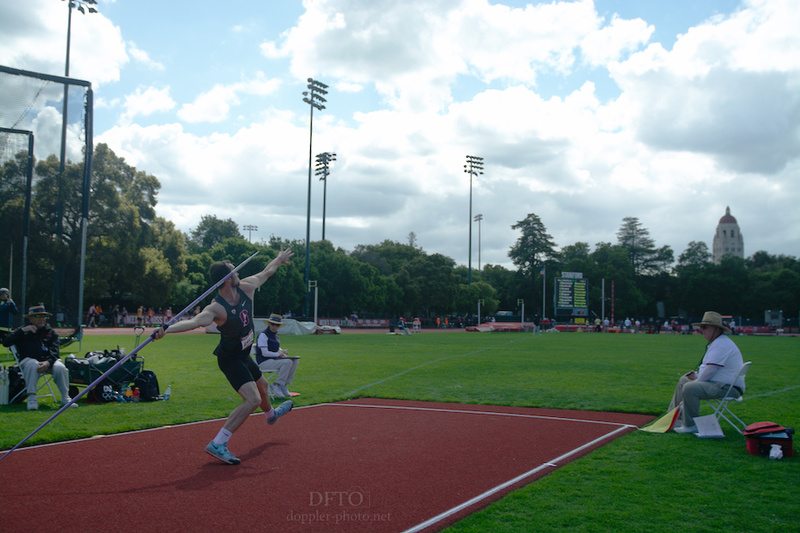 Given the layout of the infield, I prioritized javelin and de-prioritized long jump and triple jump. But even with those rough prioritizations, I also try to understand that tradeoffs that result from those decisions, and try to give myself the information to improvise once I'm out on the field. This is why my schedule has events highlighted rather than crossed out — it's super easy for me to fixate on the plan I had made, but using a highlighter means that I still have the information to adjust on the fly if the opportunity presents itself. There's another part of the plan that's more subtle, but just as important. A lot of decisions become much clearer and easier to make if you have a goal for the coverage of the event. I'll dive deeper into this during Part 2, but in short, there are a bunch of different ways to cover an event, and those choices will drive other decisions on the logistics side. For instance, one approach is to make sure to get pictures of every athlete (which tends to push one towards picking a few shooting locations and spending a lot of time in each of those locations). A different approach is to try to find a bunch of interesting, beautiful compositions (which might have you running around and trying different things, but paying less attention to the stories that are happening at any given moment). Yet another approach is to focus on storytelling (which might call for wide, medium, and tight shots of each theme). 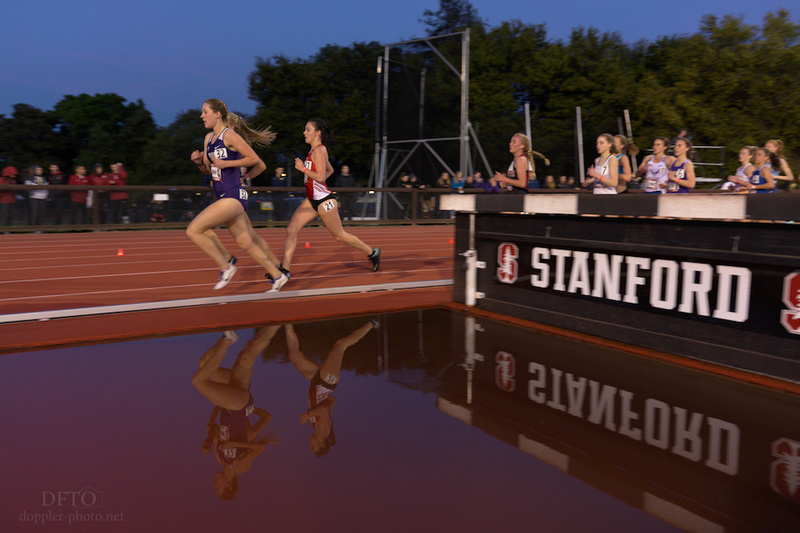 Those documentary priorities will inform follow-on decisions about what gear to bring, where to go around the track, when to leave, and when to stay. Having those themes in mind will help to make snap decisions under time pressure. For instance, there were times when 10 seconds before a race start, I would sprint to the opposite side of the track for a different angle. For a relay, maybe I wanted to focus on an individual instead of the larger group. For a sprint event, maybe I wanted to capture the crowd in the background. For a distance race, I might want to catch the entire field at the start line (which tends to be dramatically easier from the outside of the track). And then there was this moment. Put yourself in my shoes. 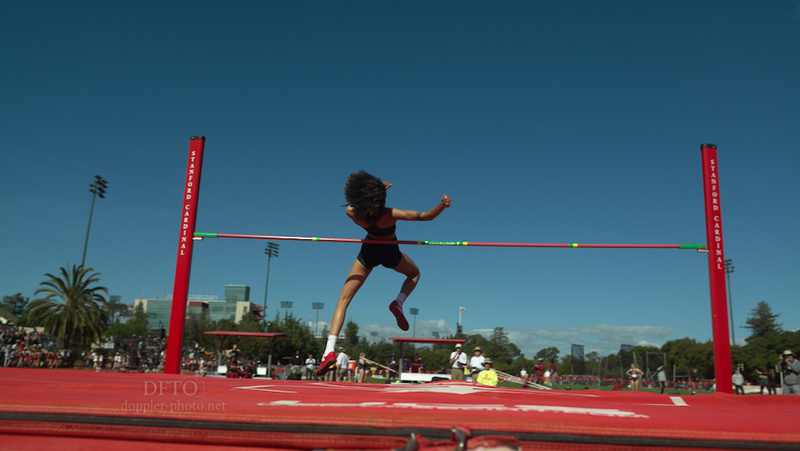 You're waiting for world-champion and many-time USA national champion high jumper Vashti Cunningham to take an attempt at an Olympics-qualifying mark in the high jump. At that moment, the announcer broadcasts that two-time NCAA national champion Olivia Gruver is about to take an attempt at a new NCAA pole vault record. You look over at the pole vault runway to see her standing there, pole in hand. What do you do? In that case, I relied on my documentary plan and stayed put. I already had good photos of Gruver. I didn't already have photos of Cunningham. Cunningham ended up clearing the height, and I got the shot I was waiting for. You can even see Gruver standing on the runway in the background. 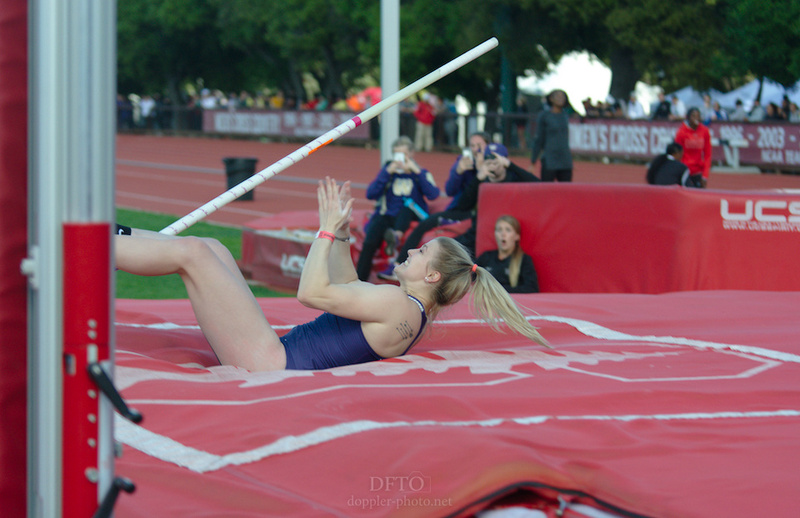 Of course, then I quickly, carefully, and purposefully strode over to the pole vault to make the catch there as well. Staying disciplined in that moment was a big risk, but not taking the opportunity to capture the high jump picture would have been an even bigger risk. I had already weighed out those risks in advance, and so the decision made itself once I was in that situation. Phew! That was a whirlwind tour of how I survived this weekend. It seems fitting, because "whirlwind" is exactly what it felt like for me. In sum, make a checklist and check it a dozen times. Make a plan, including things like what to shoot, what to skip, how to prioritize competing events, and (more generally) how you want to document the event. Based on those decisions, build the right foundation and acquire the right infrastructure to support your goals and get out there. Once you're in the thick of things, there will be more decisions to make about the kinds of moments to shoot, and the aesthetics of how to shoot them. Click here to subscribe so that you don't miss Part 2.